 Selland construction cares about the safety of our employees - Selland Construction, Inc. Since 1958, Selland Construction has viewed the safety and health of both our employees and constituents as a priority. We are continually striving to improve our performance through the decisions and actions of all our personnel. We are committed to providing a safe, healthy and productive work envoronment that is free of any recognized hazards. We believe that prevention is a key responsibility that is shared by everyone in the organization. At Selland, safe work habits begin with formal training, inspections, audits and formal reporting. Our safety effforts are backed by our Corporate Safety and Accident Prevention Program that has become the pillar from which we develop quality projects. We train our management team, supervisors and employees to identify and correct unsafe conditions to bettter promote safe work practices. Selland Safety. It's how we get work done.